Chinese acrobat Sun Zhi Cong stretched yesterday before going on stage to entertain residents of Palolo Chinese Home. She and her troupe are performing in "Chi" at the Blaisdell Concert Hall from tomorrow through Sunday. Performers Zhang Wei, left, Guo Ren Wei, Yang Son, Sha Dan and Cao Cong relaxed before the performance at Palolo Chinese Home. 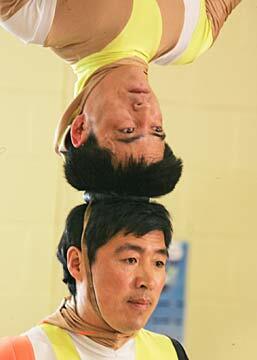 Acrobat Huang Jin Long, on top, went head to head with Fan Run Lai. 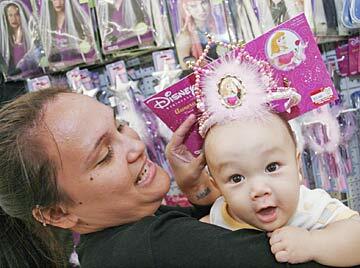 Six-month-old Chance Castro tried a Halloween costume yesterday with help from his mom, Priscilla Turk, at Saver's in Kalihi.